After my Mom passed away in the spring of 2014, we had to go through all the things in her apartment – and either give them away or keep them. So, me being me, I packed up 2000 pounds of stuff and had it shipped to my little bungalow in Sidney by the Sea. And, of course, into the basement it all went. So I hadn’t quite got around to going through the boxes (but boy, are they stacked nicely) when the John Petropoulos Memorial Fund put out a call for silent auction donations for their 15th anniversary event. So I found three pictures, in a box from my Mom’s place, and proudly took them back to Calgary with me in April. Now, the truth is that not one of these three pictures were actually ever hanging on my Mom’s walls – either in her apartment or in any of the houses she lived in. In fact, they were still wrapped in plastic. So my Mom had probably bought them to give away as a gift to someone but never got around to doing so. 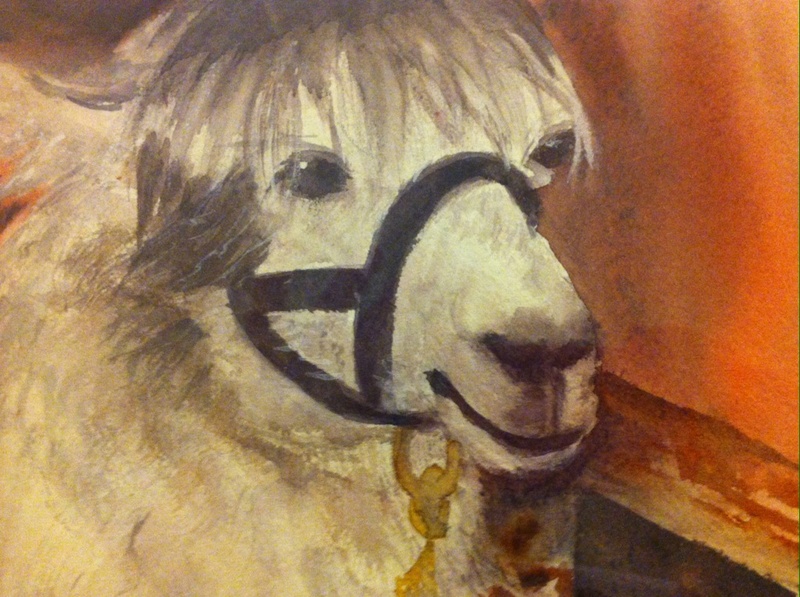 And although one of the three pictures happened to be a rather adorable watercolour painting of a cute little llama, I simply did NOT have room to hang it on any of my walls…plus I already had a pile of extra artwork in the basement. As such, I thought it was safe – and prudent – to let the llama go to the silent auction. For at said silent auction, I had ONE beer and, with 30 seconds left before the auction closed, I ran over to take a quick peek at all the items. Only what did I see? One other person had bid on him, so I quickly scribbled down my name and within minutes, I was the proud owner (again) of the llama picture. Yes, that’s right. I paid $25 to buy my Mom’s picture back. So, knowing full well I was going to get an earful about hanging on to clutter and how I need to learn to let go, etc, I crept over to the silent auction payment station to pay for my prize. It was John’s sister, Stacey (an anti-clutterite who does NOT assign emotional value to material things) collecting payment. Her Mom, Mrs. Petropoulos, passed away six months ago. So, with a big smile of relief and rather smug satisfaction, I proudly took my llama back home again to Sidney. Now there is a bit of a fun follow-up to this llama story, so I thought I’d share that with you. I found a perfect place in my home for the llama picture from my Mom’s place: the wall of my bathroom. And every time I see it, I smile. As much as I understand the importance and benefits of de-cluttering, the llama picture experience reminded me that, within reason, it is okay to hold on to an item for sentimental reasons. But that, of course, begs the question: my Mom never actually used or enjoyed the picture herself, so why would I be sentimentally attached to it? 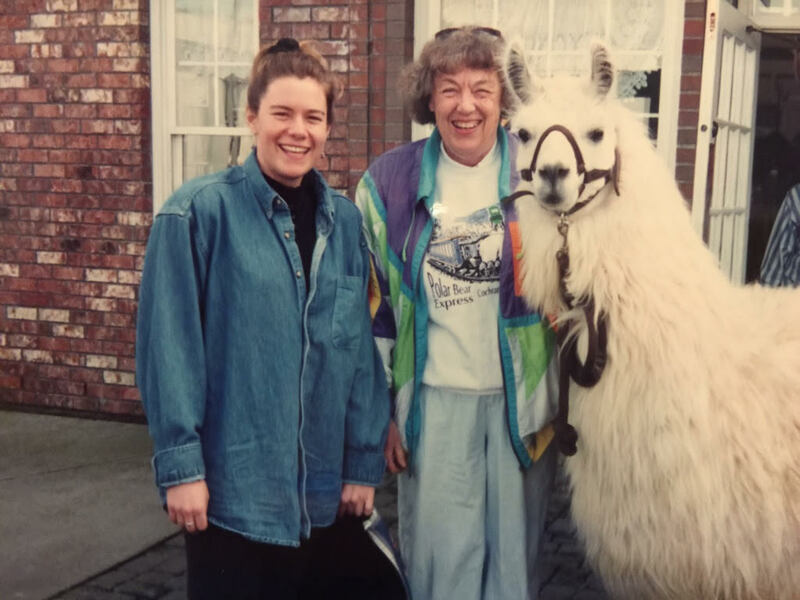 Well, it was only just the other day, I found my answer – in one of the boxes of photographs from my Mom’s place, where I came across a brilliant photo of me, my Mom…and a llama. The wonderful memories from that day in Lynden, so many years ago, flooded back. And I finally realized that’s why the framed llama picture from my Mom’s apartment meant so much to me. It’s not a particularly rational explanation, I know…but I’m okay with that. Just be sure to listen to your heart, not just your mind…for sometimes the heart remembers what the mind can’t yet recall. 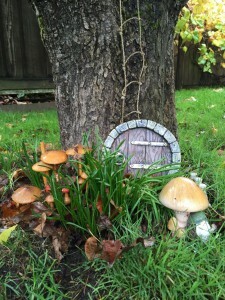 Mushrooms, gnome and hobbit door with ladder…sigh. But that little mushroom colony is so cute. Great entry Maryanne. I always enjoy reading them. Anything sentimental is worth keeping. I keep the strangeous things from my Dad. Have a great day. Thanks, Joyce! Yeah, some of the stuff we keep is pretty odd, eh?! Great column! I think people underestimate how emotionally draining it can be to de-clutter when it involves a parent’s home. The mushroom colony is too cute and you found the perfect home for it in your garden! 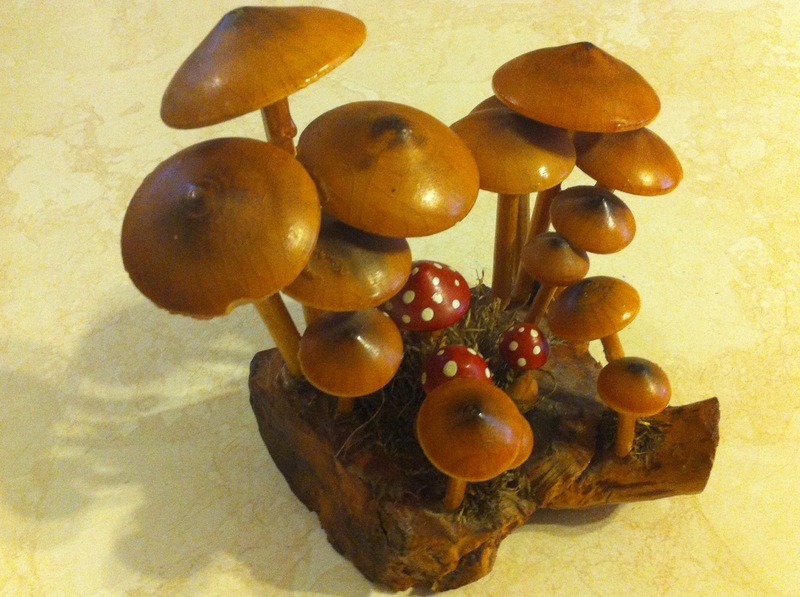 Mushroom colony…love it! That is an eloquent way of labeling my weird mushroom ensemble, Tanya 🙂 And boy are you ever right about it being emotionally draining to de-clutter a parent’s home. Take care and hope things are going well for you!